Make a delicious soup out of this! When you’ve got a family that frequently takes your cooking for granted coming up with comments like this, you have to stop and think about what you’ve just produced. The recipe has to be shared with other people! I wish I could say that I picked this bag of golden chantarelle mushrooms but I did not. They came from the overflowing open boxes of chantarelles available in supermarkets in Sweden right now. We had already started our mushroom season in the kitchen earlier in August with some sauteed mushrooms on toast. These were from our forest and when you just cannot wait to eat them this is the best way. 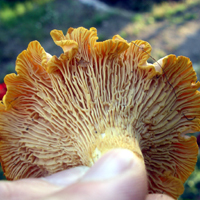 See Best and Basic Wild Mushroom Recipe in this blog. However, a nip has come into the air and I caught the customary first sniffle of the season last week, so it felt like soup time. I don’t like overloading my mushroom soups with high fat creams, butter and bacon drippings as many do in these parts. However, a little creaminess is definitely in order and so here is what I came up with that seems to have left everyone feeling that this was a very special dinner without the formality. Saute the onion and garlic in olive oil for two minutes in a soup pot. Add the mushrooms. Saute for another 2 minutes. Remove from heat and sprinkle over the flour. Return to the heat and gradually add the water, stirring so that the flour blends in. Add white wine and bay leaf. Season generously with salt and pepper and add a pinch of sugar. Cover and allow to simmer for 20 minutes over low heat, stirring occasionally. If the soup has become too thick during the cooking period, add soy milk or oat milk to the desired consistency. Remove bay leaf. Gently beat the creme fraiche into the soup over heat. Check seasoning. Heat the soup for 5 minutes.